In Grace Church, in the southwest corner of the church, right below the organ gallery where a professional choir used to sing, there’s a statue of St. Cecilia, the patron saint of musicians and church music. 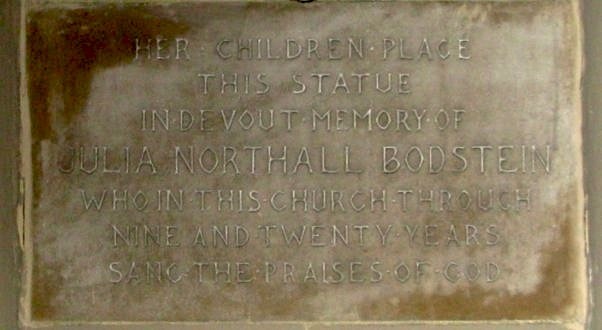 Underneath the statue is a plaque which reads: “Her children place this statue in devout memory of Julia Northall Bodstein, who in this church through nine and twenty years sang the praises of God.” Julia was the soprano soloist for the professional choir and she sang in Grace Church from 1846 (when the church opened) to 1875. I didn’t end up including her in the book, but I did research her a little. She was married to Frederick William Bodstein, and she had four daughter although one daughter, Flora, died when she was only three years old. Her other daughters were Clara, Lucy and Emily. Emily Bodstein Proctor and her husband, William Proctor, were the ones to install the plague, in 1920. The sculptor was John Massey Rhind. Julia died on June 28, 1896, when she was 72. My picture of the statue didn’t come out well, I need to go back and try again, but this is the plaque. If by any chance any of her descendants come across this post, I’d love to learn more about her. And see a picture of her!